It is time to bring your water balloon fights to the next level with Bunch OBalloons - the hose attachment with 37 pre-connected balloons thatautomatically fill and tie themselves. 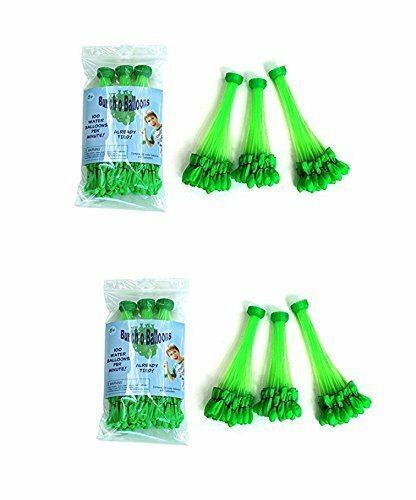 This system makes it easy for kids ofall ages to prepare 100 water balloons in just ONE minute, giving you enoughwater balloon ammo for any battle. How do we stack up to the COMPETITION? Handtying - 6 Balloons per Minute Tie-Not - 8 Balloons per Minute Zorbz - 10Balloons per Minute Bunch O Balloons - 100 Balloons per Minute Forget thetrials of filling and tying countless individual balloons, Bunch O Balloonstakes all the hassle of preparing for a water fight and lets you just enjoythe fun. Simply secure the pre-packaged attachment to a hose and you will have100 water balloons ready to use in one minute. Manufactured and distributed byTinnus Enterprises.